Renting a 7 seater vehicle is probably the best choice for those who have a larger travelling party or would prefer taking along a bigger vehicle on a family excursion. There are actually several 7 seaters of the popular Volkswagen make—three of them include the VW Touran, VW Sharan and the VW Caddy. In this review, let’s take a closer look at each. 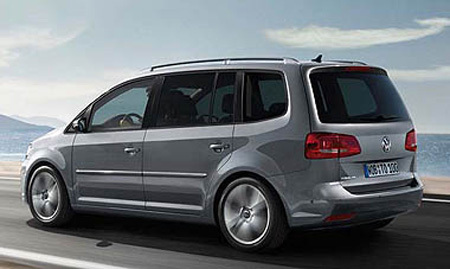 Popular VW 7 seater that’s well suited for families. Robust safety features – includes three point safety belts, ESP, ABS, break assist and air bags for all seats; curtain airbags for front and second row passengers. Firm, comfortable seats, in addition to comforts afforded to the driver’s seat that make prolonged driving more comfortable. Up to ’39 storage possibilities’ in this vehicle. It might not be the most ‘fashionable’ vehicle in terms of style. But, when it comes to hosting a holiday trip on the road, style isn’t everything. In fact, this vehicle will provide enough comforts and convenience to suit the entire family. Perhaps that’s why many people opt for 7 seater car hire over the 5 seater. This vehicle is actually rather modestly sized for a seven seater; the rear seats fold completely flat, affording a smaller group more space without the cumbersome nature of other similar vehicles. In addition to the additional storage provided by the folding seats, the vehicle offers up to 39 storage possibilities within its main cabin. This is convenient for those who need more space to store small odds and ends. Drivers will feel comfortable knowing the controls and display are simple to manage, with conventional positioning and the familiar characteristics of modern Volkswagen vehicles. Performance is good, if not a little deceiving— drivers have commented that this vehicle feels much faster than it actually is, specifically with the version featuring a diesel engine. Overall, driving this car is comfortable enough for lengthy journeys. It’s not the most stylish car, nor the best in its class, but it’s a sound rental car for those who need something spacious for their trip. In fact, it’s considered one of the better group cars in its class. You’ll love how spacious this car will be feel during a vacation. Now let’s take a quick glance at two comparable Volkswagen 7 seaters in its class: the VW Sharan and the VW Caddy. The upgraded Volkswagen Sharan brings some much needed upgrades to the existing Sharan. The upgrade notably made use of the then next generation Volkswagen engines, which bought a much needed performance boost to this class of vehicle. The vehicle is longer and wider than older models, and has a profile that looks much less like a minivan. Besides this model, there are also 6 seater and 9 seater models available; the variants of this vehicle each provide various degrees of versatility and practicality for both seating and luggage. Speaking of seating and luggage, the interior of the vehicle is very spacious and adaptable. The seats themselves can be folded into various configurations to accommodate everyone coming along for the ride, and of course their luggage, as well. This vehicle also comfortably accommodates adults in the back most row, so it’s not just reserved for the younger patrons of the ride. Drivers will rejoice at the additional glovebox in the central dash-top. The ride is comfortable despite the size of the vehicle. The assembly and arrangement of the controls and components in the front are easy to use, while the contoured seats provide great comfort for passengers. Oh, and if it gets a little cold, there’s also climate control to warm the carriage. This vehicle, specifically the 2.0-litre version, will likely provide a comfortable and better performing ride for the price. This car also doubles as a mini van and that’s well reflected in the fact that this vehicle shows off its roots originating from the popular Caddy. Due to its van-like nature, this vehicle makes a good hire for groups planning a long trip for their next adventure. The Caddy is rather large on the inside, and the space is further extended due to its highly adjustable features. The passenger seats are foldable and the rear most seats can be entirely removed from the cabin. However, the rear seats aren’t entirely easy to remove, but the option is still there for those that do need to remove them. Folding down the middle row turns the cabin into a van, what with its characteristic and spacious high roof and plenty of room despite the lack of seats. This car is also stable and secure when on the road, affording drivers a good driving experience. It is very responsive and a lot more nimble than some would expect on the road. The 2.0-litre model, in particular, works increasingly well, providing enough speed and torque to bus around a full load with little issue. 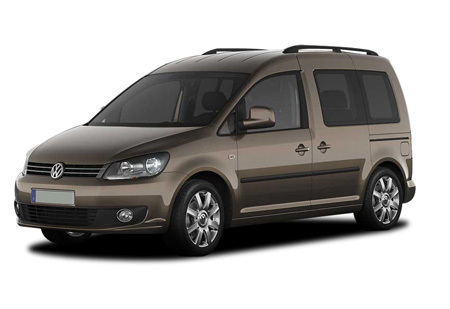 Although a van in origin, the Caddy is a great vehicle in part due to its practicality and its convenience for families. So, if you need to travel a great distance with plenty in tow, the Caddy is certainly worth considering. This vehicle is a great option for those who want a spacious and smooth performing vehicle.